Where do you meet God? Do you just talk to Him wherever you are, go on a pilgrimage or do you actually GO to a specific place to talk out your worries, dreams or struggles? Jesus met the apostles and disciples in the Upper Room for three distinct and specific purposes and Monsignor Peter J. Vaghi, welcomes us into that room with Jesus to explore how this single room changed the lives of the apostles and can change our lives too. Meeting God in the Upper Room is a personal invitation by Jesus to join Him with his disciples to share with us the mission he sent the disciples on before and after His death. Msgr. Vaghi explores the deeper meaning of the establishment of the Eucharist at the Last Supper. He goes into depth explaining the sacrament of Holy Orders and the prayer Jesus prays for his disciples and the modern Church. The Last Supper is the main focus of the book, highlighting the beauty of these Holy Sacraments. He also discusses that we are called to servant His people and not be served. Our next encounter in the Upper Room is with the disciples hiding in fear after Jesus’ torture and death. Hidden away, they were doing exactly the opposite of what Jesus had commanded them to do just a few days earlier. These are the first words spoken by Jesus when he appears inside of the locked room, “Peace be with you” (John 20:19, 21). Imagine if you were locked in the upper room with the disciples, and there He was, the risen Jesus offering peace! Jesus offered them and us even more, a Counselor who would guide them and be with them forever! How can we deny this precious gift and suppress the guidance of the Holy Spirit? While Jesus forgave sins while He was alive, it is in the Upper Room where he gives this same power to our first priests, the Apostles. He breathed on them (compared to God breathing on Adam who sinned) and commanded them, “Whose sins you forgive are forgiven them, and whose sins you retain are retained” (John 20:22-23). Unlike Adam, the breath of the “New Adam” restores the relationship between God and man through the sacrament of Reconciliation. It is here in the Upper Room that we are whisked back to the beginning of the Gospels, but this time it is not an infant birth that we are reading about, but the birth of the infant Church. It is the fire of the Holy Spirit that moves the apostles out of that little room and into the world to spread the Gospel of Jesus Christ without any fear of torture or death. But we still need our mother, which is why Mary is also in the Upper Room that day. She is not only Jesus’ mother but given to us as the Mother of the Church. After reading this book, it has inspired me to focus on the sacraments and gifts that Jesus has given us and the upper room inside of my heart where He continues to dwell. Do I deny the words that Jesus tells me as the disciples denied he was going to die or that he was going to be betrayed? Do I doubt His power and resurrection like Thomas, unless I see a miracle with my own eyes? Do I suppress the fire of the Holy Spirit or use Him to guide my words and life so that I too can be a witness of Jesus Christ? These are questions to ponder and journal about when reading this powerful book. 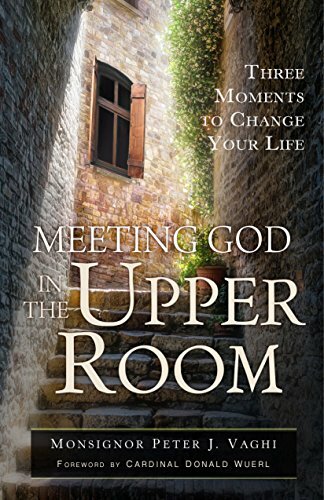 Order Meeting God in the Upper Room today and allow Jesus through these three experiences to change your life. Recalling his own Holy Land pilgrimage experience, Monsignor Peter Vaghi explores three significant events in the life of the early Church that can be traced back to the Upper Room in Jerusalem (sometimes called the “Cenacle”) in order to guide us to a deeper appreciation and understanding of living the Christian life in prayer, worship and service. Each of the book’s three parts is dedicated to one of these key moments in the history of our faith: the Last Supper and the institution of the Eucharist, the post-resurrection appearances of Christ to his followers, and the Holy Spirit descending on the apostles at Pentecost. Book Review, Catholic Upgrade, Eucharist, Faith, Last Supper, Pentecost, Sacraments. Bookmark.